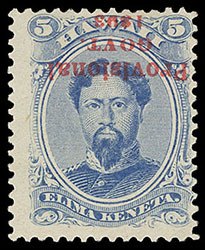 Hawaii, 1893, 5¢ ultramarine, double red overprint, one overprint heavy, second light, left margin single, full o.g., bright color, attractive centering, Very Fine; with 2008 P.F. certificate. 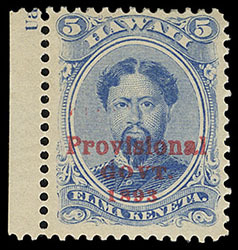 Hawaii, 1893, 5¢ ultramarine, inverted red overprint, without gum, strong color, F.-V.F., an nice example of this scarce stamp, with only 50 produced; with 1995 H.P.S. certificate. 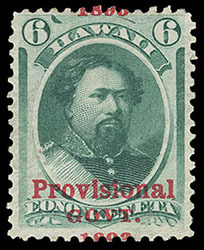 Hawaii, 1893, 6¢ green, red overprint, shifted overprint, vertically shifted, disturbed o.g., rich color, Very Fine, with approximately 50 known; with 2008 P.F. certificate. I.D.C. No. BP11-SV. Scott No. 60 var. Estimate $200 - 300. 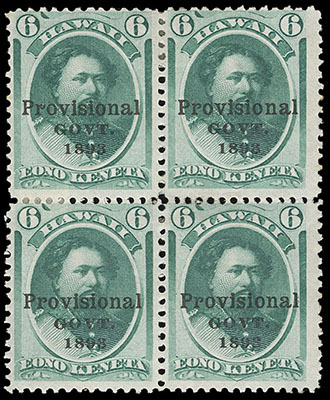 Hawaii, 1893, 12¢ black, red overprint, in combination with 1893, 1¢ green + 2¢ dull violet, red overprints on 1893, 10¢ black entire (U13) to Cincinnati, O., target canceled with red "Honolulu, Jan 5, 1894" cds and matching registry and return receipt handstamps; cover reduced at left, Very Fine. Scott No. 62+55+57 Estimate $250 - 350. Hawaii, 1893, 12¢ black, double red overprint, both overprints heavy, one split, bottom margin single, o.g., hinge remnants, with lower split overprint complete into margin, wide margins, deep color, Very Fine and choice; with 2016 P.S.A.G. certificate. 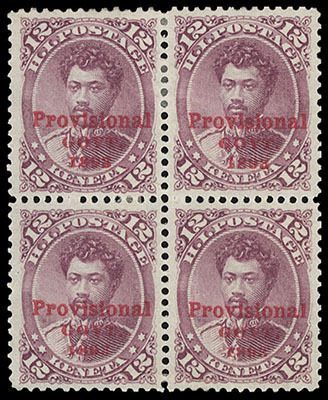 Hawaii, 1893, 12¢ red lilac, red overprint, block of four, o.g., top pair hinge remnants, exceedingly well centered, bright color and paper, Very Fine. 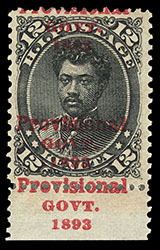 Hawaii, 1893, 2¢ rose, black overprint, no period after "GOVT", position 6 in 2 complete sheets of 50 with normal, showing 2 different sheet positions (left and right panes), o.g., never hinged, Very Fine (no photo). Scott No. 66b, 66 Estimate $400 - 600. 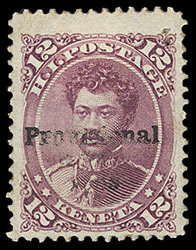 Hawaii, 1893, 12¢ red lilac, black overprint, showing lightly impressed overprint, part o.g., Very Fine, an unusual misprint; with 2007 P.F. certificate. Scott No. 69 var. $325. 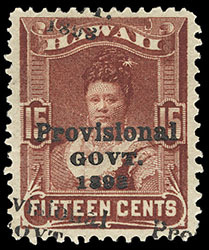 Hawaii, 1893, 15¢ red brown, double black overprint, one overprint heavy, second moderate and diagonally split, full o.g., exceptional centering, deep rich color, Extremely Fine and choice, one of the finest examples of this double overprint variety; with 2009 P.F. certificate.